Traditions are in order to be followed, and as usual we will sum up a covered tournament with a full list. This time from the first Grand Slam of the the year – Australian Open! With their support, the fans made the matches of the Swedes, quite boring ones to be honest entertainment-wise, to a party. 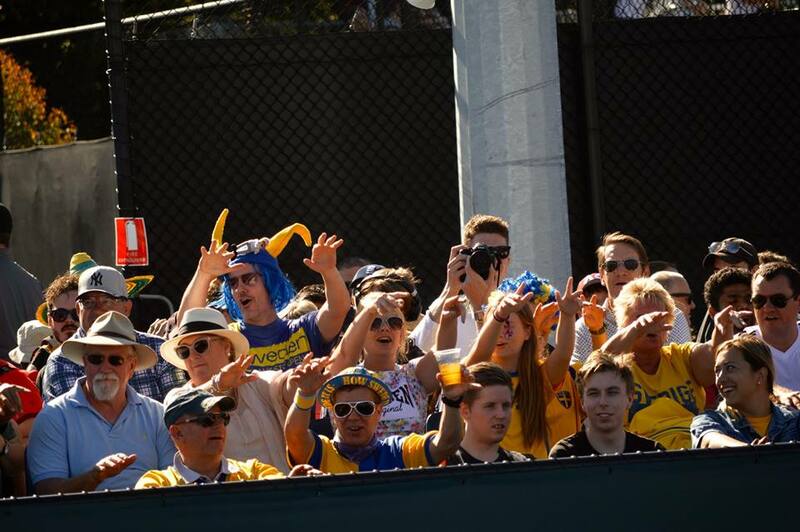 Great chants, a lot of energy and beer drinking – just as it should be! 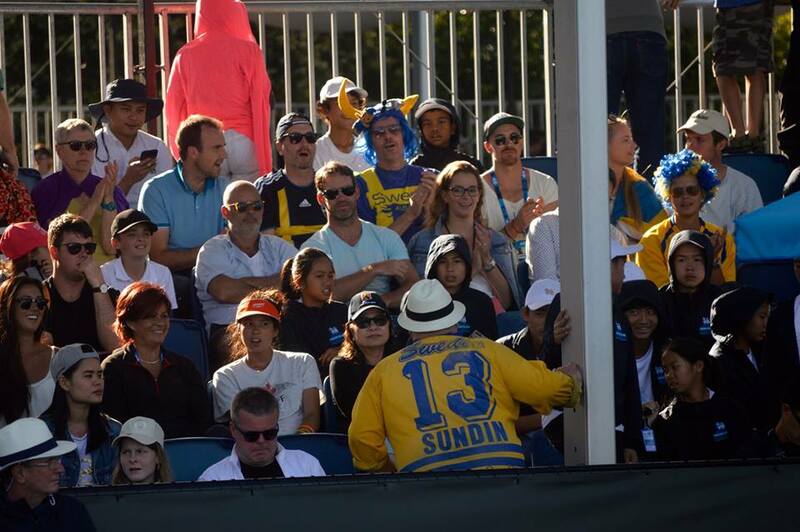 Sadly, two of the Swedes qualifying for the tournament did not show their appreciation to the fans correctly and should be ashamed of themselves. The McDonald supporter in question was a very drunk one, and as we suspect, did bet a large amount of money on the American against Elias Ymer in the qualifying final. “Come on Macka” was shouted out on a regular basis, even after the most serious mistakes from Ymer’s racquet. No, lack of feel of the game and unclear behaviour from the drunken fan was not appreciated. Hopefully the organizers will do their bit and throw out these kind of “spectators” that purely ruins the real fan-grinding-qualies experience. The press conferences we went on were many and the vast majority boring. Robot-like responses, Nadal, who constantly and constantly talked about how everything was “special” and Federer’s “amazing”. Well, not really but almost. If you have learned something by running a tennis side over the years, you know that when it’s time for Kyrgios to speak, yes, you’re there. Kyrgios says what he thinks and it does not always have to match what other players feel and think but the Australian is genuine and not fake, whatever the people might think about that. Kyrgios doesn’t hold back when it’s time to dig it at journalists with stupid questions and that was exactly what happened when he was asked about an American football player whom he, according to the journalist, was a good friend of. Kyrgios answer? “This is Australian Open man, where did that question even come from”. Hilarious. Kyrgios left the press conference despite two minutes on clock and the journalist, who earlier congratulated Mahut on victory in the French Open, despite a loss about 3 years ago (legendary moment), was ashamed of silence. Rarely encountered such genuine and nice people like the Australians. If you rush into an Australian, they are the first to say sorry, even though you were the clumpsy one. Preferred people, these Australians. Thanks to one of our many friends out there in the wild we found out that the players only make 15% of the tournament’s total revenue. $20 million in prize money should be handed out to the players, which is too much you might, but only 15% of 100% is by no means good. Tennis Australia, of course, hovers in the big money every year and will in 2019 expand the complex in Melbourne Park, which will cost a number of billions according to the reports. The crowd does not come to Melbourne Park to witness Mastercard, Barillla, Lavazza and other sponsors, no. They buy their own ticket to watch tennis and all the players trying to break records and set their mark. 15%, something needs to be done! Open category. Unclear why? Anyway, let’s continue. Was it perhaps Will Smith’s or Will Ferrells who was the best feature of the tournament, two actors who myself have idolized since early childhood? Perhaps. No, not really. Instead, we choose to highlight Bernard Tomic and Tommy Paul’s match in the second round of qualifyin as the tournament’s best. A match which was moved into Margaret Court Arena after two days of raining in Melbourne. The match that had all it’s ingredients a tennis nerd could wish for. An amazingly well-played match with two different game styles. Paul, like most Americans today, bases his game on his huge forehand and big serve. The backhand is quite obscure of course. Tomic, what a genius, on court we should say. People might underestimate his skill and ability on court because of the things he’s done outside the court but Tomic possesses a great tennismind, when he is in the mood of course, and does things you might not expect from him. Even though Tomic was completely gassed in the third set, and eventually lost in the following match, where he missed the opportunity to qualify for the main draw, he did entertain us with some great tennis. Sveinsson. Nils Sveinsson. 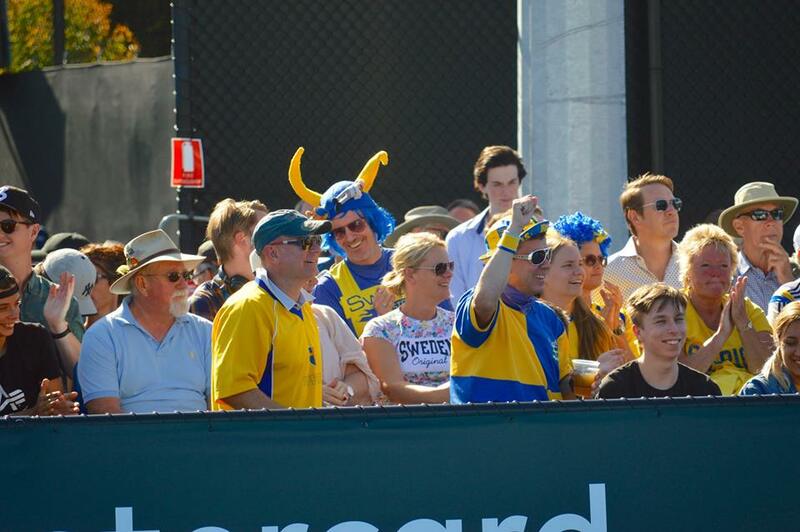 Have you been to the Australian Open for the last 20 years, you have probably seen the man who goes under the name “Norrmannen”. Nils Sveinsson is also the first guest of the first, historical episode of Tennisportalens English podcast, “The Block Return Tennis Podcast. Named after perhaps the most feared shot in tennis, the Chris Guccione block return. Soon to be launched! Nils is what is called a true tennis fan and knows when Jacob Adaktusson last qualified for Australian Open and why Blac Kavcic suddenly have lowered his toss. The Tennis knowledge is sublime and Nils is also a great guy to hang out with and just having a good time. See you in Melbourne next year, Nils! Nike’s latest collection has probably not escaped anyone’s attention. The quite obscure outfit down below (check tweet) looks like it’s been stoled from Palermo and let’s be honest, Nike can do better. The rest of the Nike-collection from Australian Open was alright but this was just a huge double fault from the designers. Yes, the Messi-dribble of the Australian Open, or Federers fake and bake if you like, was the Irish with accreditation responsible for. Unclear whether the Irishman was now a journalist or worked with TV, but this man could certainly act. Convincing the security staff outside the gate of Rod Laver Arena where media is allowed to sit, stating his friend was sitting courtside, with two drinks in his hands, he was allowed in. Since his friend had the tickets, he said, the security staff watched him closely as he proceeded to the best seats in the house, looking for his friend, with two drinks in hands of course. The umpire announced “Time” and the Irish took the nearest seat, which was sublime by the way. He then did the huge mistake of calling his friend, waving to him as he was enjoying the view. His friend was sitting in the upper “deck” of the stadium, far from the Irishman, obscure seats you may call it. The security staff watched his every move closely, as did I, and they quickly threw him out as soon as they realized he was full of it. Whether they took his accreditation as well is a question we might never get an answer on. Many were the various “Media Announcements” in the media room through the speaker system. Announcing when certain press conferences with players would be held at a certain time such as when players were on their way to the actual press conference. Yes, you need headphones when you work in the media room. Luckily I had my newly purchaded Bose Quiet Comfort 35 with noise reduction. No, I’m not sponsored. Get to the point then! Yes, well, when it was announced that Kerber’s birthday cake was donated to the media room, journalists started to run like there was no tomorrow. Great scenes! And yes, the cake was delicious. Thanks Kerber! Terrific media announcement in the #AusOpen press room: "Angelique Kerber has donated her birthday cake to all of the press. It is in the kitchen." Tennys Sandgren, the man with the most appropriate name for tennis. Yes, you’ve probably heard and read it a thousand times but Tennys playing tennis, come on, love it. Tennys had only won two matches on the ATP Tour before this year’s Australian Open and had previously failed to qualify for the Australian Open over 10 times. This year he was in the main draw thanks to his ranking (97) and stunned a whole tennis world to go all the way to a quarter final, after winning against top names like Jeremy Chardy and Maximilian Marterer. Joking aside. Add names like Wawrinka, admittedly injured, and Dominic Thiem, Tennys achievement tennis-wise in Melbourne should be praised over and over again. However, his best performances on the tennis court in his career was overshadowed by his previous activities on twitter as various tennis fans were quick to point out so much Tennys situation was trending all over the world. Obscure tweets about homosexuality, police violence in the United States, and divisions of tweets with links to the extreme right ended in public space. Sure, you might have opinions regarding politics being linked to sports but previous, obscure tweets should be exposed and they was. Good! Well, the final was as dramatic as you would have wished for. Not as well-played as the reports turned out to be and as one might think first when the match “up and running”. Two gased (tired) players, a lot of nervousness involved and really all at stake. It was doomed to be dramatic. Halep and Wozniacki was taking turns as the one in the lead and switched roles throughout the match. Wozniacki in charge, Halep in the bridge, reverse roles, yes, you get my point. Halep up 4-3 in the third set with the break and even though she looked entirely gassed, yes I thought she would win. Wozniacki stepped it up though when it really mattered and her first career Grand Slam was a fact. Amazing scenes! Nominated: Magnus Tideman, Nils Sveinsson. Ubaldo! The Italian superjournalist you hopefully know at this time. Founder of Ubitennis.com and over 145 covered slams on his track record, a bloody powerful one if you ask me. He was part of Björn Borg’s golden days, is a very good friend to Mats Wilander and Fabio Fognini’s worst enemy. Ubaldo, sponsored by Vespa and bunch of other companies, can be witnessed on Youtube as he drives around various players on his Vespa, including Giorgi. Fognini? He would drive over Ubaldo with the vespa if the opportunity would appear, Ubaldo said in our podcast, among other things. Where can you listen to the episode then? Highly unclear if the episode will get published and reach the public’s ears. The sound was not of podd quality and Ubaldo himself might not have contributed a radio-friendly voice to put it mildly. However, we had a very interesting conversation about everything from tennis players’ transparency to the media ‘back in the days’ and how the players’ restrictive and robot-like comments make it difficult for the journalists’ daily work today. He is on twitter, the living legend! The one who saw Kyle Edmund’s matches in Australian Open could not have missed Fredrik “Fidde” Rosengren’s different “fist pumps” from the coaches box. Unbelievably committed to what he does, Fidde, and of course it is liberating and uplifting to see. Edmund is obviously good at throwing a quick look at his box at times and seeing “Fidde” fistpumping like there is no tomorrow must be a delight. Great start of the year for Edmund who, with his semi-final in the Australian Open, climbs all the way up to place 26 on the world rankings. We hope Fidde, one of our former guests in our Swedish tennispodcast “Source”, all success with Edmund. Rafael Nadal would not had enjoyed the Kallhäll / Triangel tennis club outside of Stockholm. There lies the wall just over three meters behind the baseline and, according to Rafael Nadal, it’s ten meters too short. In all off his matches, he starts his return position several meters behind the baseline to then sneak forward, make a split-step and hit, still 7-8 meters behind the baseline. While his opponents is preparing to hit a second serve, he starts his position a few meters further closer to the baseline, an ingenious tactic if you ask me. A tactic that just has to put grills in the head of the opponent. In the pictures below, you will see Nadal playing Leonardo Mayer and, of course, Mayer is a good server but definitely not near the best ones in the game. Perhaps something for more tennis players to take after, Nadal tacticts while returning serve that is. Effectively, yes.